Rachel Fisher is devastated when the young man she’s loved for years leaves her to date her best friend. Her heart is broken, and she has all but given up on love. Rachel is determined to keep her mind off the pain, and she starts teaching at an Amish school for children with learning disabilities. 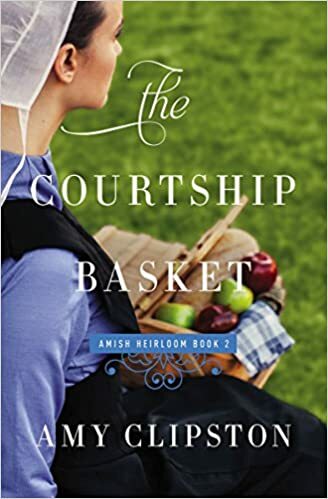 The Courtship Basket by Amy Clipston, had me at times crying then smiling as I got caught up in the this wonderful Amish Christian Romance. Real life circumstances that were described so perfectly kept me turning the pages. I admired Mike who at a young age carries the load of watching out for his sick father and little brother. He was hardworking and a caring young man. This book spoke to my heart has I remember the times in my life that I have been a caregiver. Like Mike I have become tired and overwhelmed at times. We have to remember to make time for ourselves so we can come back refreshed. Even though this is the second book in the series about the Fischer family I feel it can stand alone. I have enjoyed reading more about the Fisher girls and I can't want to continue the series! This book was sent to me by the author in exchange for my honest review. Don't forget to sign up for my daily email list and never miss a post! Join me on Twitter, Pinterest, Facebook, and Bloglovin where I share my frugal list, gardening, recipes, free kindle books, and more!